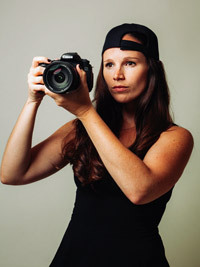 Sarah Moshman is an Emmy® Award Winning documentary filmmaker and TV Producer and in 2012 she came up with the idea to create ‘The Empowerment Project’ as a way to change the way women are portrayed in the media by spotlighting 17 strong women from a variety of lifestyles and industries. 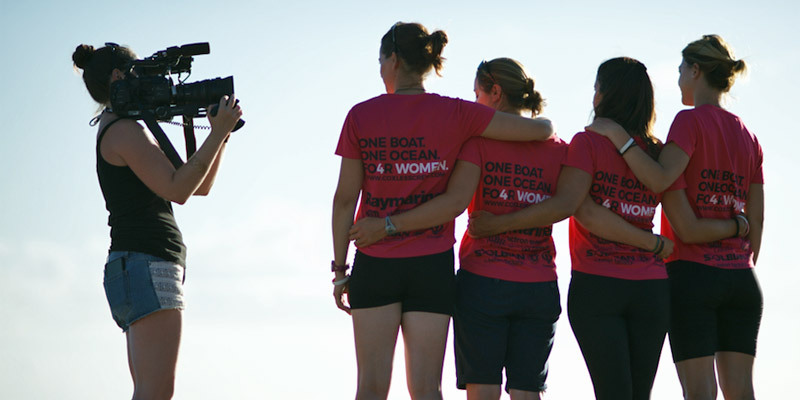 In 2015, Sarah went on to film a documentary about Coxless Crew, an all-female team of rowers who set out to become the first team of four to cross the Pacific Ocean unsupported. I grew up in Chicago, Illinois in the US and I was really always surrounded by cameras – my dad’s a filmmaker as well, so I know how important it is to tell a good story and to be a good videographer. I’ve been making documentaries since I was 16 – I made my first one in high school English class and I was totally hooked! When I graduated from college, I moved out to Los Angeles seven and a half years ago to seriously pursue my goals of working in TV and film, because this is really the Mecca of production. I worked in reality television for about five years on different shows in the US. It was a great experience, but I wanted something more out of my career. I thought, “If I’m going to work 18 hours, I should probably work 18 hours for myself, which is what I’m doing!” So it was an awakening for me as well as recognising how women are portrayed in the media in the world, but especially in the US – woman are often over-sexualised and objectified. I was tired of being a passive viewer and I felt like I could do something about it, and in 2012 after making a couple of short documentaries, also about female empowerment, I teamed up with my business partner, Dana Cook, and we decided to take a road trip, and drive across the United States to interview inspirational women from all walks of life – a pilot, an athlete, an astronaut, a mathematician, a biologist – 17 women in total. It was such an amazing experience and that became my first feature-length documentary, called The Empowerment Project: Ordinary Women Doing Extraordinary Things. It has been such a dream come true taking that film to schools and organizations around the US and around the world and talking about empowerment and equality first hand. Losing Sight of Shore is my second feature-length documentary and I’m thrilled to be continuing to shine light on stories about extraordinary women around the world. It’s my greatest passion in life. But I Skyped with Natalia Cohen and Laura Penhaul shortly after I got that email and I was just blown away. There’s just some times in your life when you have this feeling, and you just have to go after it. It was really empowering to just say “yes” to them, to say “yes” to myself and to feel like it made sense in my life and in my career. It was a little scary to get started because I know nothing about rowing. They were about to set off across the Pacific Ocean on this pink rowing boat, so obviously, I couldn’t go with them. (And I didn’t want to go with them!) So how does one make a film about a journey across the ocean if the filmmaker can’t actually be on the boat? It was a unique challenge and we got to know each other over Skype for the next few months, and sure enough, I met them in person for the first time four days before they left on their journey on the 20th April 2015. I supplied them with cameras and I taught them how to use those cameras. I gave them hard drives and microphones. Something about it was so foolish, but so exciting and I wanted to see what would happen. They believed in me and I believed in them, and from there it’s been the craziest adventure of my life, watching this journey unfold, but also for me, meeting them on land throughout their journey in California, Hawaii, Samoa and Australia. It’s a good lesson in just going with your gut. If something speaks to you and you have a feeling, it’s OK not to have all the answers, because I certainly didn’t and I certainly still don’t, but I just knew I wanted to tell their story, so I thought I’d figure it out somehow. The interesting part was that there was pretty much no way for me to receive footage before I met them on land. When they ended up coming into Santa Barbara because there was a battery issue on their boat, it was kind of the greatest blessing for everyone, but especially for me, because I live in Los Angeles, so thankfully that was very close. When they left Santa Barbara, I didn’t see a frame of footage until 68 days later. This was terrifying for me as a filmmaker. As time went on, even though I’m not an ocean person, I so desperately wanted to be on the boat with them. It sounded like such an adventure – the way they described the sunsets and the wildlife, and their relationships with each other – I was hooked. But I honestly didn’t know if I had a full movie or not until two weeks ago! That’s what it’s been like. There were six women in total 0n the Coxless Crew. 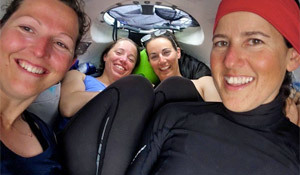 Three of those six women rode the entire nine-month journey from San Francisco to Australia – Natalia Cohen, Emma Mitchell and Laura Penhaul. 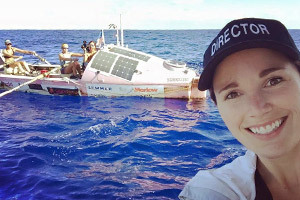 Isabel Burnham did the first leg from San Francisco to Hawaii, Lizanne Van Vuuren did the second leg from Hawaii to Samoa, and Meg Dyos did Samoa to Australia. 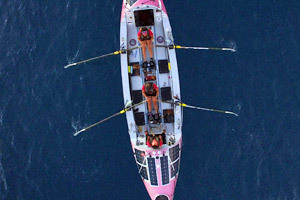 They are the first team of four to row the Pacific Ocean, the first team of women, and the fastest team. I keep saying they’re breaking world records, but honestly, they’re setting world records because this has never been done before. them questions from time to time like, “Hey! How is Lizanne doing on the boat? Is she still sea sick? Can you talk about that?” I would also email them shot lists, but really, the footage was up to them and how much they wanted to share. But never fear, I have a lot of material to work with. They were in a polyphasic sleeping pattern, so these women rowed 24 hours a day – two hours on, two hours off. They were only sleeping for about an hour and a half at a time for a total of five to six hours a day. Can you imagine being that exhausted and burning thousands of calories every day but at the same time you had to keep up and eat enough to maintain the nourishment that you need, and also get enough sleep to be a coherent human? The sleep deprivation certainly challenged them, but that was their pattern and it was so vital to maintain focus on the journey, because if they thought about: “This is going to take several months,” or “We’re not going to be there for 97 days,” they never would have gotten through it, so their mentality was all about just stroke by stroke, shift by shift, just get through the next two hours, and then the next two hours, and then the next two hours. I don’t know how they didn’t go insane, but that’s how they coped with it, and it worked. It’s been step by step for me. I started funding the project myself at the beginning, but then I met these incredible producers, Audra and Courtney Smith, who came on board as executive producers, so they brought on some funding as well. I’ve applied for several grants that I’m waiting to hear back from too. Filmmaking is tough. It’s not often: “Well I’ve got the budget, so now I can start.” It’s “I’ll start and then I’ll figure out the budget,” so my intention has always been, “Well let’s just get this journey filmed and make sure they make it, and then I know I have a project.” I’m now trying to raise money to finish post-production so I can share their story with the world. I have an amazing fiscal sponsor, called Cinefemme which means people can donate to Losing Sight of Shore as a tax deductible donations. Cinefemme (a registered non-profit) takes about 7% and then the project gets the rest. It’s been wonderful with all the press and attention on the project. Some people have donated. Every dollar helps because I’m here, at my computer, trying my best to make a movie! It feels like the girls have passed the baton to me now. It’s now my turn to cross my Pacific in a lot of ways and so that’s the journey I’m on. They’ve inspired me no end, so I think about it as just getting through each day. Get through as many hours of footage as you can so those are behind you and just keep going. It’s good to have inspiration like the Coxless Crew to remind you what they had to go through to complete this journey, so I really have nothing to complain about! I felt like I was part of the team, and by the end we all became one. They’re the most extraordinary people I’ve ever met. I’m eternally grateful to them for letting me be a part of this adventure. I’m hoping the film will be done by October this year. I turn 30 on the 6th of October, so that’s my emotional deadline! I think I can pull it off, but we’ll see. The release is different to when it’s done. I don’t have a distributor quite yet, so stay tuned for updates on our Facebook page. We’ll be keeping everyone informed as to how post-production is going and announce where and how the film will be released. If you want to join the Losing Sight of Shore team and help Sarah finish this documentary by donating click here.